Kathleen Berglund walks with broken hand while her bike is pushed to the top. Photo: Shelby Meinkey. I received a call from Shelby Meinkey Saturday afternoon to invite us to come out and ride Thunder Mountain. St. George was supposed to be hot and we try to ride that trail at least once a year. The plan was made. We woke up early and headed out to Hatch to meet Shelby. Upon arrival we were offered a second option, that of riding some virtually unknown, unridden singletrack that would drop us down onto Casto Trail. The shuttle we were told would only take about 25 minutes and then we would have a 17 mile ride down into Red Canyon. Seeing that we had driven for close to two hours, a longer ride sounded better, more trail miles to the gallon. Everything was going swimmingly until we actually hit the gate for the singletrack. We were headed up the Showalter Trail. This trail is on all the maps but sees almost no traffic of the two-wheeled variety. Even better, hardly anyone knows it is there so it feels like it is in the middle of nowhere despite being only a few miles away from all the tourists in Red Canyon. As soon as we passed the gate our forward progress came to a screeching halt. There were more downed trees than standing ones, or at least that is how it felt. It looked like God was playing pick up sticks. I'm sure many of you have had to wade through downed trees before, but this was something all together over the top. There wasn't just one downed tree every 30 yards there were 15-20 downed trees every 30 yards. This meant that you could ride for 15 seconds and then you had to find a way around the trees. We spent more time walking around the trail than actually riding on the trail. We struggled along like this until we reached a summit and left the trees behind for sagebrush. We had gone about five miles in just under two hours. We stopped and had our picnic. We began making better time. We were now heading downhill and the downed trees were much less frequent. This little adventure was gaining momentum in the fun department quickly. Then I heard that thump that everyone who rides off road has heard at one point or another. The one where you know someone just went down and might not be getting back up. I hit the brakes and looked back to see my wife Kathleen laying on the ground. I hopped off the bike and walked back to see what had happened. She did not get up quickly. She was convinced that something was seriously wrong with her hand. I inspected it, Shelby inspected it and we all concluded that it was jammed. Kathleen convinced me that it would be a good idea to try and pull it back out, so I did. She didn't even flinch supporting our idea that it was not seriously hurt. I pulled it twice with no sign of pain from Kathleen. She said she could ride as long as it was smooth and we decided it would be just as quick to continue on then to turn around. We were almost to the Red Canyon trails and they were going to be buff and smooth. In hindsight, this is where we should have turned around. A hike a bike back up and out would have been faster. The buff singletrack waiting us in the canyon was anything but. Horses had been on it too early and it was so rough in places it was almost impossible to ride with two good hands, let alone an injured one. We began the slow silent walk down to the car. Carl Munford and Shelby rode ahead and then would come back and help Kathleen and I drag her bike up to the top of the hills. She rode when she could but the trail looked like someone had driven a giant rototiller through it. Those fruit snacks tasted like heaven when hour five and six started to slowly click by. It was at the start of hour seven when we ran completely out of water. Luckily the last two miles were buff and we were able to coast down into the parking lot with Kathleen riding most of that last two miles. We trekked 17 miles in 7.5 hours, pushing Kathleen's bike for most of the last nine. It wasn't until the next day that we got her hand X-rayed to discover that she had not only broken her hand but it was broken in two places. I think this was probably the absolute worst scenario that could have happened on this trail. Looking back, the scenery was phenomenal. There was no one around and given a little trail work, the trail would be amazing. If you are the adventurous type, who feels comfortable reading maps in the backcountry and you check trail conditions first, this would be an epic ride. Getting to the start is pretty easy. Across the road from where you would turn to start Thunder Mountain there is another dirt road, follow it. Check your maps and find your way to the Showalter trail. Follow Showalter to Hancock and then down onto Cassidy. There are lots of trails for variations out in this neck of the woods. 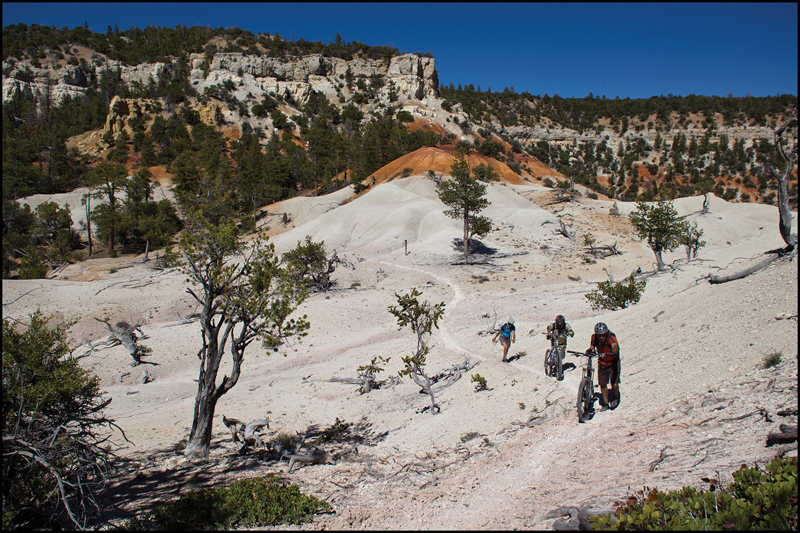 The Dixie 311 loops through here and links 311 miles of some of the most remote and beautiful singletrack in Southern Utah. Check out 2-epic.com for the route. The Red Canyon Visitor Center also has maps available. Most importantly, if you decide to attempt this route make sure that you dump plenty of fruit snack into your pack before you start because you never know what you might encounter.